Much rubbish is written about change. This guide helps to differentiate between different change needs and how to develop appropriate strategies for different scenarios - from continuous improvement to transformation - from crisis management to steady building. You can make a considerable short-term impact on the work behaviour of individuals through explanation or exhortation, supported by suitable formal or informal rewards or 'punishments'. If there are no changes at the deeper levels of attitudes and values, these behavioural changes will be superficial and, after a period of weeks or months, behaviour will return to former patterns, more compatible with the underlying values. There is a mass of research evidence to reinforce this, and the graveyard of business history is littered with the bones of organizations that have failed to make change stick - usually because of a complete failure to understand what it takes to really change a large organisation. This paper tries to put together some useful ideas, which may help a management team who face a clear requirement for change. They don't provide you with a set of recipes or one clear-cut way of going about things, but they give you some building blocks on which to base your planning. Understand the 'Implicit Contract' - Individuals and groups of employees have an implicit, often unconscious, equation which influences the effort or type of personal contribution they are willing to make over a sustained period. The 'equation' makes a comparison between the effort, commitment or personal contribution they perceive themselves to be making and the bundle of rewards and satisfactions that they perceives the employer is providing in return. Their perceptions are obviously strongly affected by the comparisons they make with other people. They will be affected not only by current work and personal circumstances but also by prior experiences in work and by what they understand the effort/reward relationship to have been in this organization up till now. In the extreme, it is the unexplained or unconcerned violation of this implicit contract which is the most frequent cause of people leaving their job, reducing their effort or sabotaging the plans of their bosses, either blatantly through blocking or subtly though parody and sceptical humour. The process of communication at the beginning of a change process therefore needs to provide a clear and compelling rationale for 'why we and, in particular, I have to change'. This communication and all the reinforcing behaviour that goes with it must try to give some indication of a new but equally satisfying 'implicit contract'. Evaluate the Change Equation - Very many attempts to change organisations fail. One writer, Reg Revans, created an equation that sums up what is needed for any proposed change to work. He says that D + V + M must be > P where D = level of Dissatisfaction with current state of affairs, V = desirability of the Vision of the future on offer, M = quality and credibility of the Method or process for getting there and P = the overall Price in terms of objective and personal costs. So there is a large incentive to address and, wherever possible reduce, both types of cost. How radical are the changes you must make to satisfy the expectations of key stakeholders, including customers, employees, regulating and funding bodies? How much time do you have before one of these key groups runs out of patience and begins to withdraw support? The organisation is non-viable and will collapse without short-term drastic remedial action. In commercial organisations, this is likely to lead to a financial crisis; in public service, to a collapse in quality of service or an unsustainable service/cost relationship. Prognosis is to fix the immediate problems. Healthy outcome is to create the conditions for radical, long-term improvements in performance. Failure to stop the rot. Failure to move beyond a short-term fix to a quite different longterm transformatory strategy. The strategic environment is showing signs of fundamental shifts, which will create pressure for radical changes in the nature of the organisation's business. In the long run, the organisation will either fail, or not realise large opportunities for competitive advantage, unless it achieves fundamental changes in what it does or how it does it. Leadership possess the ability to envision transformatory change, the capacity to express this vision to the organisation and the persistence to lead a complex strategy with many variables and phases to enact the vision. Transformation implies the involvement of the whole organisation in radical change. Often, it is important to prepare the wider organization for a programme of Transformatory change. This may entail sending some quite radical messages and even removing people who may seek to block change. In the Model, this is described as 'Clearing The Ground'. No organization can afford to stand still. Enterprises that do not see the opportunity to engage in ambitious change at a particular point in their existence still need to pursue improvement and cost reductions in all that they do. A wellplanned and executed process of business improvement, affecting many parts of the organization is described as a 'Positive Maintenance' strategy (Often described as 'boring' by the financial markets). No radical shifts in the strategic environment, which would threaten the fundamentals of the business. The organisation has built core competencies and an organisational system, which enables it to be a superior competitor and, which cannot easily be replicated by competitors. Leadership of the business has a long-term mind-set and a predilection towards incremental growth. There seems to be a common misconception that 'good' leaders all have the same characteristics - often described by such rather vague terms as 'charismatic', 'decisive' or 'dynamic'. We would maintain that the reality is much different - that there is a very large range of leadership behaviours and therefore leader characteristics that can be successful - it all depends on the context. For example, a full-blown corporate crisis, where the survival of the enterprise is at stake will require a vastly different repertoire from leaders than the challenge of building long-term market shares - and applying an inappropriate repertoire of behaviours can be disastrous. Remove and replace people, getting the right people in key positions. Create a 'Critical Mass' - Are there sufficient people behaving and apparently thinking differently to be visible and to act as a model for others? Is their collective impact sufficient to overcome existing group norms and social pressure to conform? Some people have much greater influence than others. Do you understand who are the key influencers so that you can make them part of the critical mass at the earliest possible stage? Equally, or perhaps even more, important, do you recognise who are the blockers that will have a negative effect on the change process and whose influence must somehow be neutralised. Create Leverage - Use ordinary events, management processes or the adaptation of systems to create disproportionate effects on behaviour or thinking. For instance, consciously manage the timing and sequencing of events to send particular messages, stack the odds more in favour of acceptable forms of action, make small but significant happenings visible to a wider audience, deliberately design teams both to create their normal outputs and also to develop the capabilities of the members at minimal extra cost. Make good use of Symbolism - Involves recognising the strange law of hierarchy that all subordinates tend to assume that all the behaviour of superiors is intentional and has meaning beyond its face value. It therefore involves choosing what senior management behaviour will be seen, assisting with the interpretation and trying to avoid modeling 'old behaviour'. Provide lots of Reinforcement - Most organisations are much better at punishing than at rewarding. Even where they give careful attention to the socalled reward system, it can often have significant de-motivational effects on a high proportion of people. Reinforcement in some contexts is by financial reward, but in the context of change, more subtle messages of approval or appreciation or even just interest seem to have a more powerful impact. Shift in thinking from 'either/or' to 'both/and' e.g. Don't try to tackle values and beliefs head-on - Because the deepest factors affecting work behaviour (i.e. values and beliefs) are often very private, it is inadvisable to attempt to work directly on these at the beginning of a change process. There is strong evidence that change in behaviour leads to changes in attitudes and eventually to changes in values and beliefs, not the reverse. 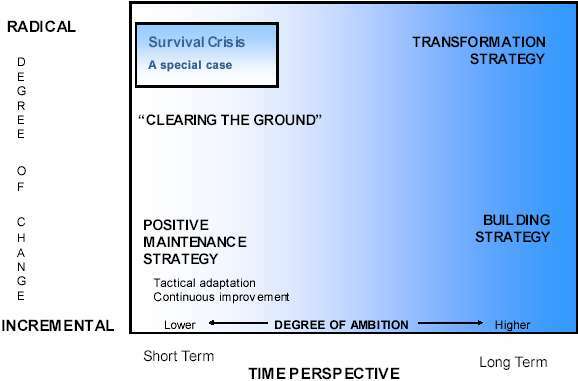 When people are feeling reasonably secure, understand why change is necessary, have begun to change their behaviour and are prepared to trust those around them, then it is possible to bring the unspoken to the surface and to have discussions that allow individuals to examine and question their values, to recognise the link to behaviour and to begin the long-term process of adaptation along with others. For similar reasons, attitude surveys can produce very misleading results if they are undertaken at a time when change is proposed and because the results are then difficult to interpret, can increase levels of distrust and unrest. Not much detail is required at this stage. Just enough is needed to get buy-in from key influencers. This involves an extensive communication process eventually, but the timing of each stage of 'roll-out' is critical and the wording at each stage needs to be carefully handled to deal with the inevitable cynicism that greets an overoptimistic scenario. Typically, the first stage will include key managers and often 'buy-in' is obtained by getting them to put some detail on the bones of the top team's earlier work. Following the first stage, there needs to be further extensive direct communication with every other person in the organization. This communication process must give equal emphasis to the changes that are required and the rationale for making them. In most cases it is advisable to undertake at least some of the most urgent tasks in parallel with or before this communication process to remove the suspicion that 'it is all talk'. It seems that it is not possible to over-communicate during a period of change because of the fact that people need continuous reassurance, much more explanation than would be reasonable in other contexts, reinforcement about some fundamental aspects of security (i.e. your job is safe so long as we can be successful, rather than a caste iron guarantee of job security no matter what) and a drip-feed explanation of what the change actually means for them (i.e. what will actually be different). Following the explanation and persuasive process, a large proportion of people are likely to need some form of training to give them a much deeper insight into the new behaviour and processes and where needed, to give them new skills. These training processes can also provide a forum for getting a deeper understanding of what further difficulties there are in implementing the changes. Arising from the discussions with key managers, there will need to be further more detailed work on those business processes and management systems which are inappropriate for the new context. Inappropriate probably means that they encourage behaviour that is inconsistent with the desired aims and that they send out the wrong messages to people inside and outside the organization. How long it will take and how likely you are to get a good outcome i.e. will you get a quick success? Approaches to career development, include a re-evaluation of appropriate career pathways and the range of support for individual development. This will include looking at and redefining groups of key jobs whose emphasis needs to change and also individual roles of people near the top of the organization and how these need to relate to one another. Because this definition process makes the job requirements clearer, it may also lead to a clearer recognition of the match or mismatch between the requirements and the personal style and capabilities of the jobholder. It may include a consideration of what formal and informal processes of collaboration need to be developed. It could involve teambuilding where new teams are being brought together or where there is a requirement for a group of people to begin working in a more collaborative or even collective way. As was indicated earlier, this is normally a later consideration, where the change is largely occurring within an existing organization, because it becomes clear what structure is required as a result of the discussions about business processes and role relationships. In the case of a merger, however, where the change of structure has to be introduced relatively early, it is the new structure itself that conveys to people inside and outside the organization what changes are being introduced. Remember that a really sustainable change in a large and complex organisation will take between 5 and 10 years to achieve. And the process of change in itself will have to be adaptable, because the world keeps changing around you. Copyright Charlotte Chambers and Don Young, May 2004.